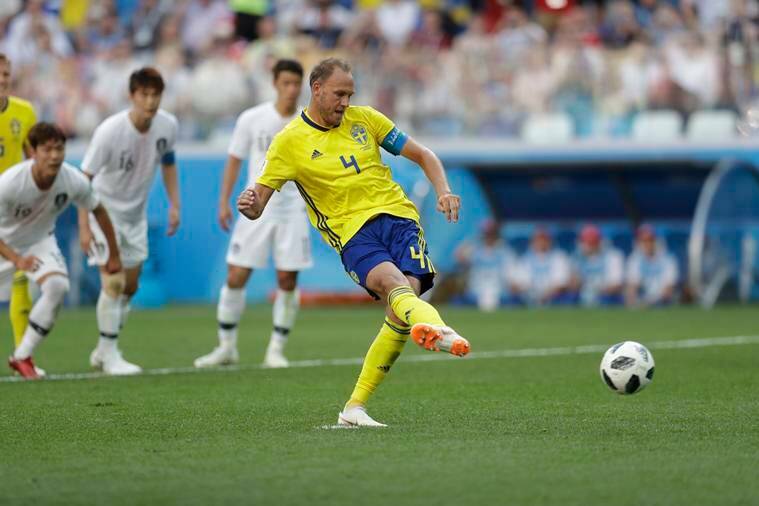 FIFA World Cup 2018, Sweden vs South Korea Highlights: Andreas Granqvist scored the solitary goal in the game from the penalty spot. FIFA World Cup 2018, Sweden vs South Korea Highlights: Making a return to the World Cup after 12 years, Sweden knocked on the door multiple times but each time were stopped by South Korean keeper H W Jo. But Sweden got the all important goal in the 65th minute when Claesson was brought down in the penalty box and VAR confirmed it was a penalty. Skipper Andreas Granqvist stepped up to give Sweden the lead and that is how things remained until the end of the game. With that, Sweden won their first game at World Cup since 1958. Korea, despite decent chances, were unable to put Olsen to test. Sweden, thus, go level on three points with Mexico after first games in Group F.
Just five minutes left to play at Nizhny Novgorod stadium. Can South Korea get an equaliser? They've threatened but not had decent shots on goal. Final change for Sweden: Gustav Svensson replaces a limping Seb Larsson. SOUTH KOREA SUBSTITUITION: Jung Woo-young replaces Kim Shin-wook. First Sweden goal at the World Cup since 2006. SWEDEN WITH HUGE PENALTY APPEAL in the 62nd minute. And it is going to be checked via VAR. Heart in mouth moment for South Korea. Claesson is suspected to have been brought down inside the box. And the referee points at the spot. PENALTY SWEDEN! M W Kim is guilty of bringing the Sweden player down. Right decision upon seeing the replay. Big chance for Sweden to score! Free kick from the foul comes to Jansson and his header at the near post is smartly stopped and parried away by Cho Hyun-woo! Causes my colleague to exclaim, "this guy is unbeatable!". 30 minutes more, will he remain unbeatable? Hwang Hee-chan is booked for a silly foul on Augustinsson. With the Swede down on the ground, Hee-chan wacks him in the back. Chance for Korea! J C Koo leaps highest fto a cross from the left and unmarked at the near post, he heads wide. Hits the side netting even as Olsen makes a dive. On second looking, it was well wide of the inside of the post. Big chance early in the second half for Sweden to score and take the lead. Comes up to Forsberg at the edge of the box, cuts inside and has a go from distance but it goes way over. After the first 45 minutes, Sweden and Korea are locked at 0-0. Been more from Sweden in the first half than it has been about Korea. Lung bursting run down the right hand side by Son and leaves Grandqvist for death but the Swiss player somehow manages to stay with him and gets a block on after an attempted pull back into the area doesn't work out. South Korea have been the team with more possession for now but both teams have failed to create a real chance. A 0-0 draw looks high possibility now. The Swedish and South Korean teams are exchanging hand-shakes after national anthems of both countries have been played, we are seconds away from kick-off now. Virat Kohli will be traveling to England soon to face an old nemesis, but before that, he extends some love. FIFA World Cup's Twitter handle says that it has got three matches for us and that might be enough to deal with that dreaded day. Joe Root, Jonny Bairstow, Jos Buttler and Liam Plunkett have sent their wishes to their football-playing counterparts through the ECB Twitter handle. The two superstars have different ways of cheering for their team. Wayne Rooney likes to go the flashy way, putting out a tweet with an extremely fancy message like "Can't wait for kick off later and cheering the lads on. Good luck @England #ThreeLions", Zlatan Ibrahimovic is keeping things simple and subtle. There was a riot, mayhem and a French newspaper declared England “A country of idiots.” Sandip G tells you more. This is England's first World Cup since 2006 without Wayne Rooney in their ranks. The former captain and England's all-time highest goalscorer currently embroiled in a rather unsavoury exit/no-exit situation with his club Everton but all of that takes a back seat when your country is about to play in the World Cup, doesn't it? So how are Sweden here? And where is Italy? For those of you who follow only the World Cup Finals and let the qualifiers slip under their radar, Italy finished second in their qualification group and faced Sweden in the two-legged playoffs. They lost the first leg 1-0 in Stockholm and a shocked San Siro stared in disbelief as Sweden managed to hold Italy to a 0-0 draw. That made the ongoing World Cup finals the first since 1958 that doesn't feature an Italian team. That match left Italian pride and a TV studio set in shambles. Well this is an interesting stat, there have been four World Cups in the 21st century and England have one just one of their opening matches in all four. That win came in 2006 due to an own-goal by Paraguay. Otherwise, they have drawn twice (2002 and 2010) and lost once (2014). They have suffered from this incredible phenomenon of going into World Cups with absolute superstars in their squad and then bottling it like those superstars have never played in a big-match atmosphere ever before. Rio Ferdinand, Frank Lampard and Steven Gerrard were part of these groups. This is how the teams that finished in the top four of the 2014 World Cup have faired so far in Russia 2018. Champions Germany were defeated by Mexico 1-0 on Sunday, their first loss in an opening World Cup match in 30 years. Runner's up Argentina were held to a 1-1 draw by the motley crew of professional and semi-professional players that is Iceland. Third-placed Netherlands are not even there in Russia. Fourth-placed Brazil were, like their South American rivals, held to a 1-1 draw, albeit by a team of professional players that is Switzerland. Not that it needs any spicing, such has been this World Cup so far. The controversy is that a member of Sweden's coaching staff was caught sneaking around in a closed Korean training session. 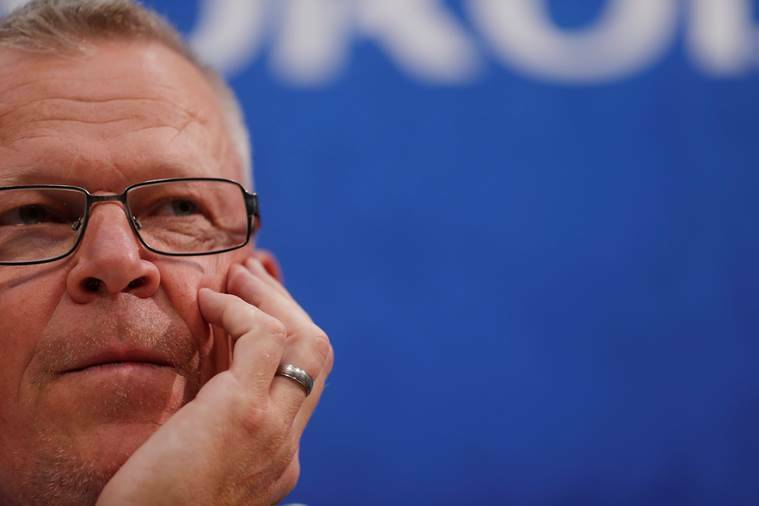 Sweden coach Janne Andersson, though, went on to douse a potential fire, saying that the concerned staff member only heard about a practice session and nothing about it being closed. Poor chap. Buth South Korean boss Shin Tae-yong devised a rather unique technique to deal with any snooping eyes. South Korea manager Shin Tae-Yong; "We put four different numbers on our players' shirts in training to confuse Swedish spies. Europeans can't tell our players apart by their faces." "We put four different numbers on our players' shirts in training to confuse Swedish spies. Europeans can't tell our players apart by their faces."